There is something mysterious and secretive about Lady’s Slippers flowers that almost takes your breath away. What could they possibly be hiding inside those elegant pouches? And who are they trying to seduce? It turns out that this special show is not for people at all! It is all part of an elaborate scheme to lure an unsuspecting bee into delivering pollen. The story begins when a bee, beguiled by the sweet-smelling flowers, eagerly enters the pouch in search of nectar. But alas, the flower contains no nectar! However the bee, now temporarily trapped, is gradually able to work its way towards a hidden back-door exit, picking up some pollen on the way. Then the whole process starts all over again. The bee is tempted to come inside a second sweet smelling flower. Here it brushes past the female flower parts, inadvertently transferring the pollen and thus fertilizing the seed. Lady’s Slippers, so called because their flowers are reminiscent of delicate sandals or slippers, are a type of orchid. World-wide there are about 50 different species of Lady’s Slippers, many of which are quite rare. 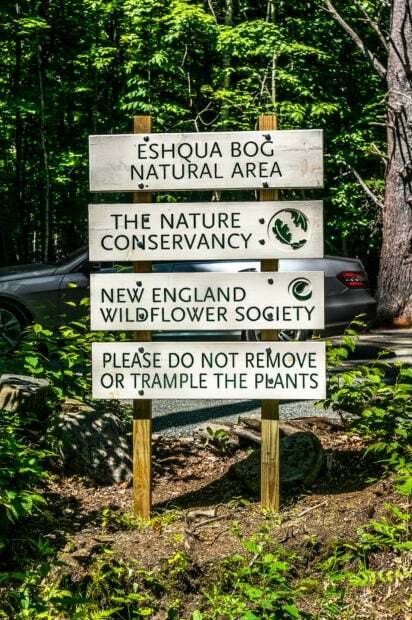 And four species—the Moccasin Flower, the Ram’s Head Lady’s Slipper, the Yellow Lady’s Slipper and the Showy Lady’s Slipper— all considered rare, grow wild here in Vermont. 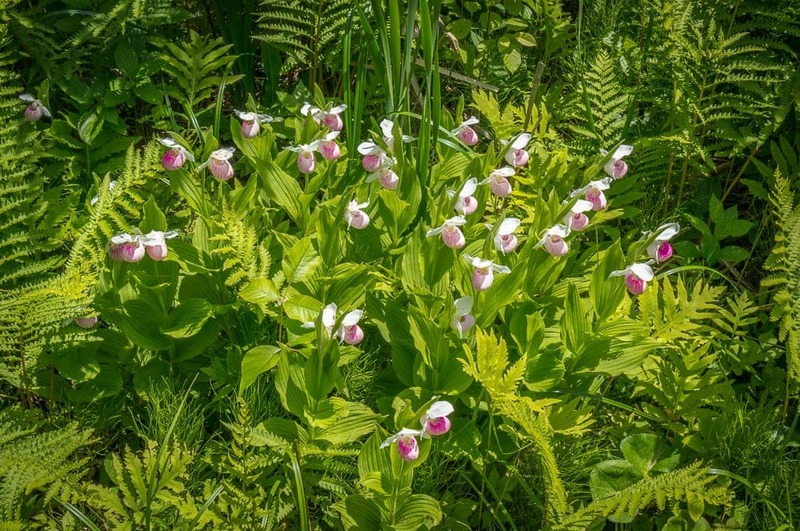 Eshqua Bog, on Garvin Hill Road in Hartland, is a unique 8-acre wetland that abounds with Showy Lady’s Slippers. 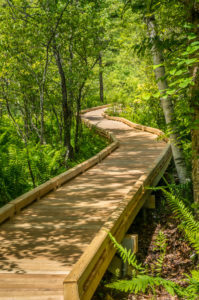 And, although less numerous, it is also home to Yellow Lady’s Slippers, Pitcher Plants and many other rare plants that have adapted to this special environment. A while back two venerable conservation organizations—the Vermont Nature Conservancy and the New England Wildflower Society— joined forces to jointly manage this singular habitat and to create a place where we, the public, can enjoy some of these rare plants up close. (There are driving directions on both websites). 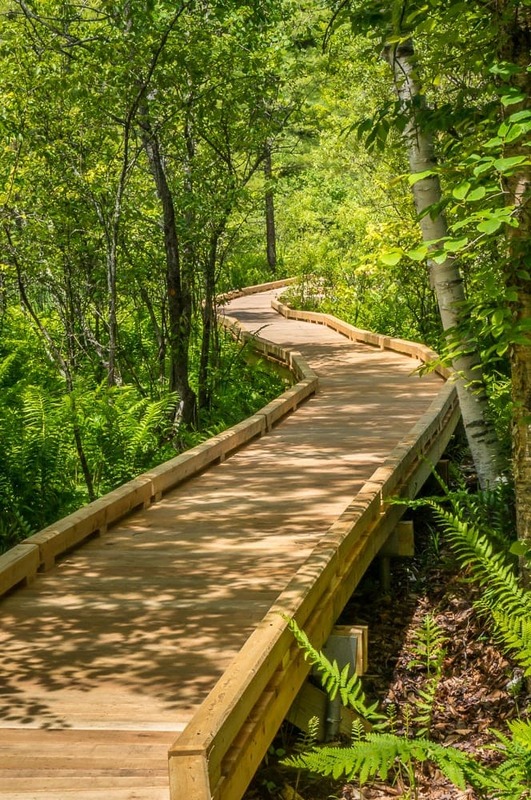 Recently they installed a sturdy accessible, 450 feet long boardwalk that traverses the bog, so that visitors can enjoy the flowers up close without getting wet feet or trampling on any of the special plants that grow there. If you would like to see the Yellow Lady’s Slippers (Cypripedium parviflorum) in bloom, plan a visit in the first week in June. But be sure to return during the third week in June for the Showy Lady’s Slippers extravaganza. 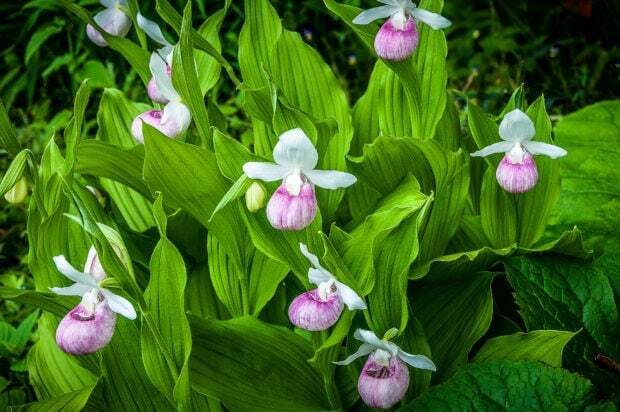 Showy Lady’s Slippers (Cypripedium reginae) are sturdy plants with multiple stems that grow about 30 inches high. And, as you can see in this picture from our visit in 2015, the abundant flowers are readily visible amongst the ferns and other bog plants. Once a visitor to our garden, seeing my three clumps of Showy Lady’s Slippers, blurted out in a horrified voice ‘Did you take those plants from the wild?’ Nothing could be further from the truth! 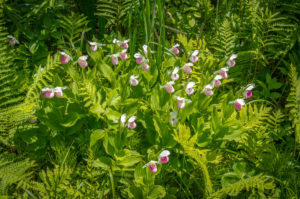 It goes without saying that taking rare plants like Lady’s Slippers from the wild is strictly forbidden. But, some fifteen years ago, I bought a single plant of the Showy Lady’s Slipper from Don Avery of Cady’s Falls Nursery in Morrisville who has perfected the technique of propagating these difficult plants from seed in a nursery setting. 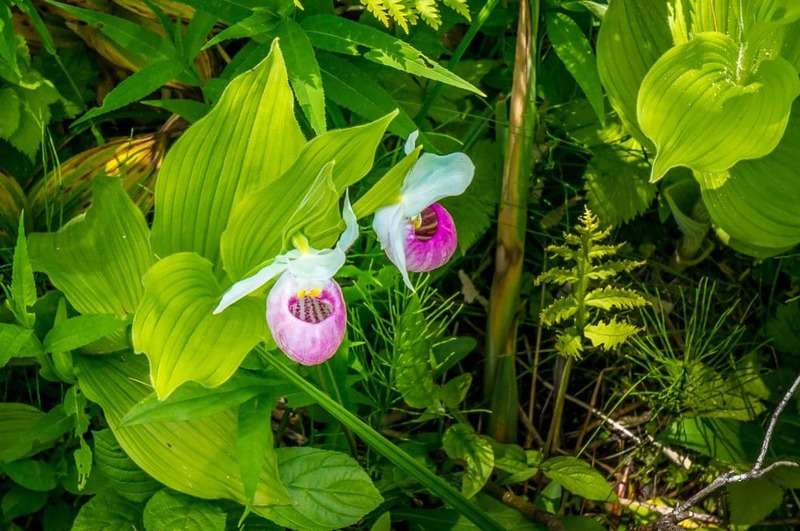 In the wild the seeds of Lady’s Slippers will only germinate in the presence of a particular fungus, a condition that is next to impossible to duplicate in the nursery. But about twenty years ago it was discovered that, if the dust-like seeds are infused with a special mix of hormones and sugars, they can also be persuaded to germinate. The resulting seedlings are very slow-growing—it take about five years before you have a salable plant. However, with great patience, over time Don has painstakingly built up a large stock of Showy Lady’s Slippers, including a rare white form, which he both grew in his gardens and also offered for sale. Don also provided careful instructions for how to site and care for my new treasure. I followed his rules to the letter, my plant flourished, and after a few years I decided it was large enough to divide. I now have a good sized group of these beauties positioned at the entrance to the back garden where I can enjoy them every time I stroll outside. Great pictures,I was kayaking part of the clyde river last summer and paddled upon “Fairy slippers”What a treat.Tiny aquatic variety of Lady slipper.